The Vance Center over three days in Santiago, Chile, convened gatherings of Latin American colleagues in three key programs: Pro Bono Promotion and the Pro Bono Network of the Americas; Women in the Profession; and the Lawyers Council for Civil and Economic Rights. 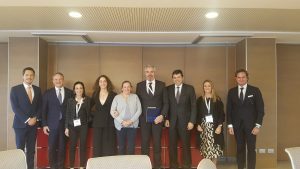 Held in parallel to the International Bar Association´s 2019 Regional Latin America Forum, the events included hundreds of participants. 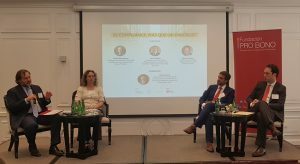 More than 80 Latin American law firm practitioners participated in a public conference entitled “Pro Bono, Human Rights and Best Corporate Practices”, focusing on the role of pro bono practice in corporate compliance and governance. Conference presenters included representatives of the UN Office of the High Commissioner for Human Rights, Price Waterhouse Coopers, and Universidad Diego Portales, among others. Vance Center Committee members Werner Ahlers (Sullivan & Cromwell) , Todd Crider (Simpson Thacher & Bartlett), and Rúben Kraiem (Covington and Burling) also spoke on the panels. In another meeting of Latin American law firm pro bono coordinators at the offices of Barros & Errázuriz Vance Center Committee member Antonia Stolper shared her experiences serving on the internal pro bono committee at at Shearman & Sterling where she is Americas Regional Managing Partner. The Vance Center and Fundación Pro Bono Chile also organized a half-day meeting of the Pro Bono Network of the Americas. Representatives of 12 clearinghouses discussed concrete steps to implement the Network’s 2019 strategic work plan, which focuses on the various migration crises in the region and further engagement with law schools vis-à-vis pro bono practice. The WIP International Steering Committee held its annual meeting, with participation from 12 national chapters: Argentina, Bolivia, Brazil, Chile, Colombia, Costa Rica, Domincan Republic, Ecuador, Guatemala, Panama, Peru, and Uruguay. Each chapter representative presented on programs and pro bono efforts in her respective country, and the committee discussed opportunities for a pro bono project involving all of the national chapters. A working group also presented a preliminary version of the Mentoring Toolkit, a regional collaborative project intended for any of the chapters to use to create or improve their respective mentoring programs. The working group will continue to develop the toolkit throughout this year. The WIP Chile Chapter hosted a seminar entitled “An Interdisciplinary Perspective on Gender Equality: Challenges and Best Practices“, which more than 200 people attended. Vance Center Committee member Veronica Rodriguez (Paul Hastings) made opening remarks and introduced keynote speaker Gonzalo Smith, Chief Legal and Governance Officer at Falabella. His presentation focused on diversity in the workplace, the why and how. The seminar continued with a panel composed of Universidad Santo Tomas Dean Maria Olivia Recart, economist Andrea Repetto, and sociologist Eugenio Tironi, with University of Chile professor Lucas Sierra moderating. The audience voted 71% yes and 29% no to the question “do you think that establishing quotes for women partners would promote the professional development of women lawyers?” and the panelists discussed the results. The Legal 500 Editor for Latin America Tim Girven then presented an analysis and some surprising data about the increase in women lawyers and partners in Peru, Dominican Republic, Chile, and Mexico. Overall, Girven analyzed that the current legal landscape for women in the region and noted that the numbers are increasing but some were growing at a faster rate. The seminar concluded with a short inspirational video promoting gender equality for all professions. 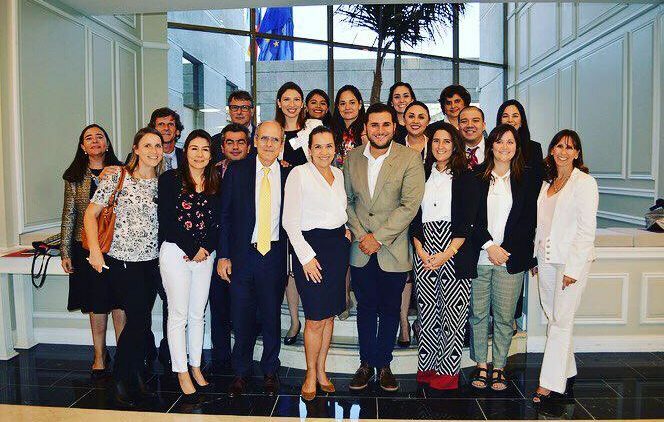 The Vance Center’s Lawyers Council for Civil and Economic Rights held its annual meeting at Barros & Errázuriz, with twelve participants from eleven countries: Argentina, Brazil, Chile, Colombia, Costa Rica, Dominican Republic, Ecuador, Mexico, Panama, Peru, and the United States. The Council discussed steps for execution of upcoming projects on preventing and redressing corruption and strengthening judicial independence through monitoring of judicial appointments in Peru and Guatemala. The Council also discussed the creation of a working group for Venezuela and the continued focus on the political situation in Nicaragua.